The relics of Blessed Ekaterina (Malkov-Panina) were uncovered on October 20 at Pukhtitsa Holy Dormition Monastery in Estonia. Blessed Ekaterina had been approved for local veneration by the Holy Synod of the Russian Orthodox Church on March 7, which was celebrated at Pukhtitsa Monastery on March 22. I fell in love with the image of this ascetic from the first, and as it turned out later, rather well-known story from her then biography, and now—hagiography. The future Pukhtitsa saint and eldress had only just arrived at the holy gates of the monastery that day, to remain there forever. She was wearing the clothes of an ordinary laywoman of the first quarter of the twentieth century—of course in a hat. Even if Ekaterina had put her hat on her just for the sake of an educational “flick on the forehead,” it would have still been beautiful and instructive! But Ekaterina foresaw the future. The “city belle” would in fact be that hapless novice who would soon leave the monastery and, perhaps, would remember the incident with the hat with a secret inner shudder. I would bet! The other sisters who were nearby certainly remembered it—not that Blessed Ekaterina herself kept such stories in her memory. The saints, in general, are not fixated on their own persons or on the impressions they make on others. The daughter of the prominent military engineer Malkov-Panin, having graduated from nursing school, a sister of mercy at the fronts during the First World War, Mother Ekaterina arrived at Pukthtitsa when she was thirty-three years old. Thus, behind the external image of a secular young lady in a fashionable hat stood a completely ripened person who not only did not shun the heavy work that awaited every Pukhtitsa novice, but who also happened to have seen the horrors and bloodshed of the war—a serious foundation for spiritual labors. She could have lived quite prosperously in Estonia, and certainly would have been removed from the nightmare that the persecuted faithful of Russia found themselves in. But Ekaterina had been interested in the spiritual life from an early age. Actually, a desire for the theater of military actions, the desire to alleviate the sufferings of others, is a natural altruistic impulse for a person on the path of complete self-denial. And the Pukhtitsa Dormition Monastery, even if to exist humbly in the usual rhythm of its grueling physical weekday labors, is already a place of podvig and unseen bloodshed. Moreover, those years were harsh years. The sisters did not get enough sleep and went hungry. The podvig of foolishness-for-Christ’s-sake2 is something completely incomprehensible because of the exceeding exclusivity of the voluntary deprivations. 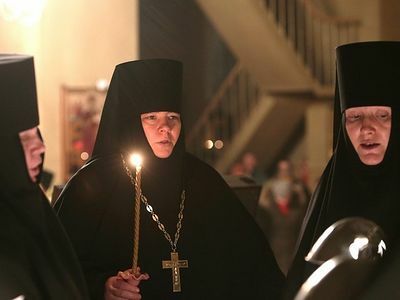 However, one can imagine what a hot, fiery torch Mother Ekaterina was, illuminating the difficult daily life for those monastery nuns who had the spiritual eyes to see who it was living with them, and what an internal charge of love for God they themselves needed, so that their monastic labors would not be limited to immeasurable physical labors, but that their souls would grow and be transfigured. 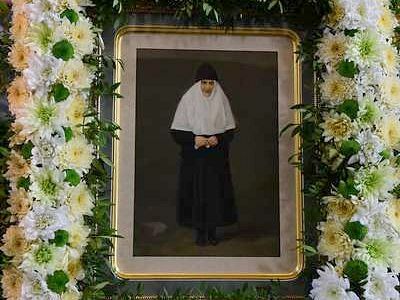 Mother Ekaterina would advise the sisters to live simply and not condemn others. The reason for condemnation, the eldress explained, is an inattentive inner life. Actually, in this advice, simple at first glance, is found all the depth of Christian asceticism—all its beauty and grandeur. But whoever has at least tried to labor in asceticism knows how easy it is for the spirit of genuine evangelical simplicity to “slide right out of our hands.” Sometimes we confuse it with oversimplification, sometimes we exchange it for stupidity, for rudeness, and justifying it as “simplicity,” we slide into idle talk. Then it’s one thing after another… and Blessed Ekaterina’s hat comes flying at us—an eternal warning to all of us: Watch yourself, be attentive, monk! Don’t watch others. Sometimes the blessed one, having gone all of Great Lent on just water and prosphora, had to “break the fast” in front of all the good people in the church of God with a raw egg—an example, frankly speaking, too extreme for those of simple-minded perception—but an example that tears the secret covers from the concept of genuine inner freedom: Not everyone can eat only prosphora, not everyone can eat raw eggs in Holy Week, but absolutely everyone can learn not to judge others. In her life it is said that Matushka began to openly behave foolishly after the death of her predecessor—Blessed Elena—in 1947. Like a soldier at a battle station, she stepped into the vacant place of this special and rare, God-given ministry. After World War II—already the second war in Mother Ekaterina’s life—it did not become any easier or less sorrowful to be a nun. You always had to work hard at Pukhtitsa to feed yourself. And the services, and the Church fasts?! It was all on the sisters’ shoulders. Later, new times brought new challenges. And Mother Ekaterina, besides her voluntary podvigs, already bore the cross of the ailments of old age that were coming to her. Ascetics do not have quiet final years. The sisters remembered her nightly prayers at the cathedral, her kneeling at the holy spring, and the “eccentricities” so characteristic of the blessed one. Her behavior was already closely watched, for the eldress did nothing without a reason: Everything had its hidden spiritual undercurrent, which often could not be guessed immediately. Lessons that concerned precisely the monastic life were the most precious lessons to her. According to St. Seraphim of Sarov, determination is the basis upon which a monk builds his salvation. Mother Ekaterina seemed to embody in herself this beautiful and triumphant determination; she as if breathed it, conquering the trials of the monastic life. She was simply incapable of doing it differently—in an ordinary way, without fire and sacrifice. “You are the temple of God and the Spirit of God lives in you!” the eldress would say, reminding us of the apostle’s words by which are revealed the doors to spiritual treasure. Don’t look at me—you already have everything within you! The seething ocean of all kinds of thoughts in which the human mind is constantly drowning is the sole serious hindrance to beholding the Divine Light within yourself. Her large gray eyes radiated and her kind smile illuminated her elderly face. Meanwhile, she had to comfort those who bore their obedience in the far meadows, who were exhausted from work and who, perhaps, didn’t have enough strength for lofty prayer but only a weak, tired, “Lord have mercy!” And Mother Ekaterina, having bought several bundles of sweet barankas,3 headed off on a long journey—it took almost the whole night to get to the monastery’s hayfields. The nuns’ joy knew no bounds at the sight of the lone figure of their eldress, trudging through the woods, through the wet morning grass to help them—with bundles of barankas to bolster their physical strength. Of course, it wasn’t just plain barankas, but something more. Mother Ekaterina was tonsured into the mantia4 only two years before her death—she passed through everything in the novitiate. Ascetics in those days sought neither the mantia, nor honor, nor distinctions. The main thing is to not condemn anyone and to live simply—then your inner work will flow in a stream of collectedness and attention. That’s what’s truly valuable. 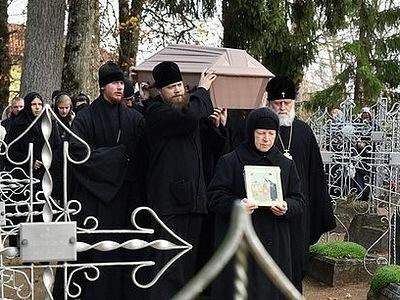 And today, abiding in her native monastery through her relics, Blessed Ekaterina has as if come again to support her own—in a white apostolnik,5 through the wet morning grass, straight from the monastery cemetery. And how could she not support them?!... And although in the Estonian land there is no more post-war famine, or the previous heavy haymaking with a scythe, the monastic life was and remains a podvig—only, not every eye can see this podvig and not every heart can understand it. And the blessed Eldress, enlightened by God, now sees sighing and tears of each sister. She has saved up what is necessary, urgent, and salvific for every one of her pilgrims—and of course, a sweet baranka! 1 For more on this story, see the article “’Such Was My Heart—To Comfort Everyone, But Not To Pity Myself!’ Blessed Eldress Ekaterina of Pukhtitsa Monastery (1889-1968).”—Trans. 2 A particular asceticism in which someone voluntarily acts foolish and even mad in order to hide his spiritual gifts.—Trans. 3 A traditional Russian snack, somewhat similar to a pretzel, often hung in stores and at festivals in big rings—Trans. 4 Fully tonsured monks and nuns, who have taken their final vows, wear the monastic mantia.—Trans. 5 The cloth veil that covers a nun’s head—Trans. How does a monastery that was never closed in the Soviet years and that has raised up abbesses for many convents in various dioceses of the Russian Orthodox Church live today? Does it preserve the inheritance left by former abbess Mother Barbara? We spoke with the current Pukhtitsa mother superior, Abbess Philareta (Kalacheva) on these questions and on monastic life in general.